Sisters representing the five continental areas of DSI (from left) Sisters Pilar del Barrio (Spain); Anne Fitzgerald (North America, Amityville); Alison Munro (South Africa); Coronata Korie (Daughter of Divine Love, Nigeria); Margaret Mayce (UN-NGO Rep.); Maria Alejandra Leguizamon (Peru). Not pictured: Sister Cecilia Espenilla (Philippines). The Commission on the Status of Women is probably the busiest time here at the UN. Women from all over the world converge upon New York to explore the critical issues facing women and girls worldwide. And, that includes Dominican Women! 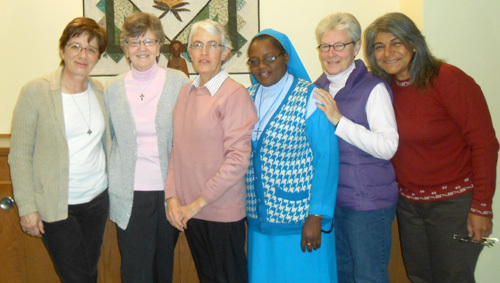 Dominican Sisters International (DSI) is once again very present. Sisters representing each of the five continental areas of DSI have been attending the Commission sessions, as well as the many side events that have been offered. With us this year are Pilar del Barrio, OP (Spain); Cecilia Espenilla, OP (Philippines); Anne Fitzgerald,OP (North America); Maria Alejandra Leguizamon, OP (Peru); Alison Munro, OP (South Africa). We have also had the company of Sister Coronata Korie, Daughter of Divine Love from Nigeria, and a great friend of our Nigerian Sister Paulina Ogbonnaya, who attended last year’s session. Transformative leadership is about making others better as a result of your presence, and making sure that that impact lasts in your absence. By empowering people to speak their own truths, creating and enabling an environment for individuals to advocate on their own behalf, leaders will foster a positive sustainable impact in their community, nation, and world. Sister Maria Alejandra, from Peru, then spoke about her experience working with the Aymaran women in the altiplano region of Peru. Based on this experience, she said that those who have the ability to truly listen,have the capacity to lead in an authentic manner. She commented further that the potential for leadership is something that we carry within us; and as such, it needs to be cultivated and supported. She and her Dominican Sisters of the Most Holy Name of Jesus do this in some of the most marginalized parts of Peru, as they accompany the people in their struggles against human trafficking and the terrible destruction to both people and the natural world through the mining industry. During her stay here in New York, Maria Alejandra met with the members of the NGO Mining Working Group, and we have made a commitment to continue our conversation with her regarding this critical issue in Peru and other parts of Latin America. She and her colleagues there, can be our source of information from our “people on the ground,” lending greater weight to our interventions here in New York regarding the impact of mining on both people and Earth. It was also my pleasure to welcome Sister Jenn Schaaf, OP (Blauvelt), who serves in Campus Ministry at Yale University, along with six Yale students for the first week of the Commission. The students immersed themselves in the experience, and enjoyed the sights of the city as well! The next DomLife Update will highlight the reflections and impressions of both the sisters from DSI and the Yale students regarding their experience here at the UN.